First formed in 1992, and stomping their way around the jazz clubs and festivals of the UK ever since,. The Yorkshire Stompers are one of the liveliest bands around. Featuring the powerful rhythm section of Annie Hawkins, Terry Binns and Richard Speight, and the legendary reeds and vocals of Frank Brooker, the band has been strengthened by the addition of the vastly experienced Greg Wadman on trumpet who has played professionally with a number of bands. We also welcome the exuberant Alan Bramley on trombone. Alan has led bands in Leeds and the Bristol area for many years. 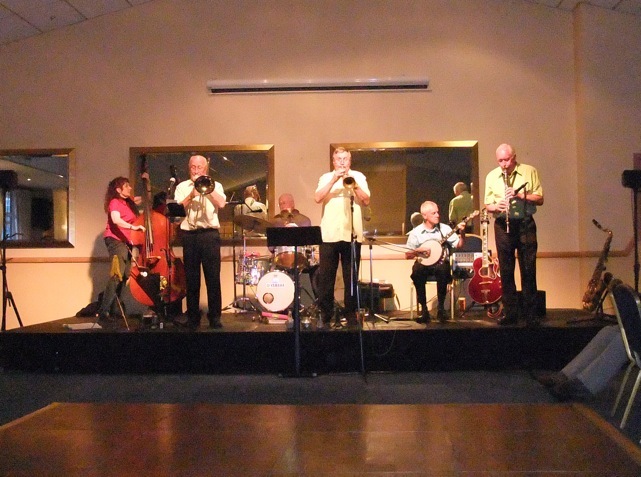 One of Yorkshire’s most popular bands for several years, The Stompers play a wide-ranging, exciting repertoire of classic jazz, popular songs, spirituals and ballads with good humour and enthusiasm.